In a bid to reunite the overseas family members with their loved ones in Canada, the minister for Citizenship and Immigration Canada, Chris Alexander, has promulgated the reopening of parent and grandparent program (PGP) on 2 January 2015. The minister emphasized on the achievement of parent and grandparent program, stating that Canada has received over 70,000 grandparents and parents since 2012. This figure shows the highest level of grandparent and parent access in almost two decades. Alexander appreciates government's Action Plan for accelerated family reunification and the backlog has been minimized by almost 54 percent. 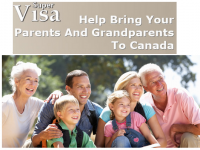 Parents and grandparents from overseas nations, who would like to visit their families in Canada, must apply for Parent and Grandparent Super Visa. This visa remains a swift, expedient option for grandparents and parents, who want to spend an extensive period in Canada along with their family members—Canadians or permanent residents. Till date, around 45,000 Parent and Grandparent Super Visas were granted with an issuance rate of more than 80%. It is anticipated that utmost 5,000 latest, complete Grandparent Super Visa applications will be received in 2015. Canada's Citizenship and Immigration Minister, Chris Alexander, has said that the country has one of the most liberal family reunification programs across the globe and the Canadian government is taking necessary actions to progress processing times and minimize backlogs, so that family members are reunified with their dear ones more swiftly.